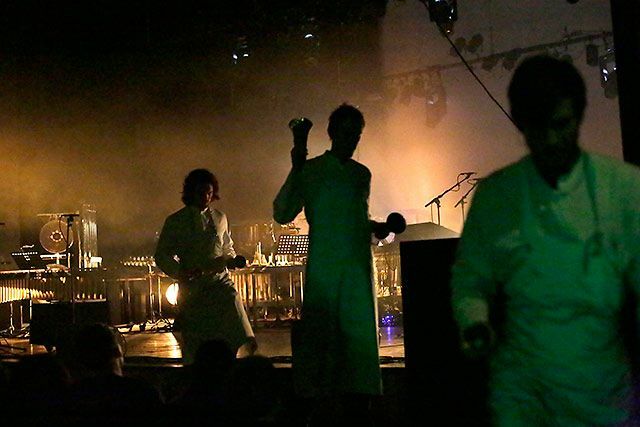 Before triggering clips and samples on the computer, Pantha du Prince and The Bell Laboratory “trigger” the musicians. Yes, before there were machine clips, there were human patterns, and in performing Terry Riley’s legendary classical new music composition “In C,” the ensemble has to do just that. In a beautiful chorus of chiming tones, that orchestra is augmented with digital embellishment. The result makes for a live performance that expands the role of the computer into a large-scale instrumental ensemble, venturing into territory perhaps not as often associated with Ableton Live as genres like dance music are. But Ableton has lavished attention on electronic composer Pantha Du Prince and his ensemble in a series of videos that amount to a complete documentary on the work and how it was produced. Pantha du Prince’s music has always shimmered with beautiful sounds, but here, percussion form an otherworldly realm of glittering rhythmic waves. Via the project’s Facebook page. But the real stars here are the acoustic instruments. Microphones bring you closer to the delicate sounds, but this is otherwise timbral design in the world of physical sound. I actually had the pleasure of wandering the Drum hall for a few minutes at Musikmesse with Dave Hill, Jr. of iZotope, himself a talented drummer (and Ableton veteran) – thanks for that, Dave. We spent some moments handling cymbals and talking about their design. Coming from the realms of code and electronics, there’s something comforting about discussing the hammering of metal (and at least I’m not entirely inexperienced there, having played in a gamelan ensemble for some years). Pantha du Prince & the Bell Laboratory “Spectral Split” (Official Music Video) from Sandra Trostel on Vimeo. Pantha Du Prince & The Bell Laboratory – Photon from Panta Rhei Project on Vimeo. And from four years ago, the artist talks to Rough Trade Records whilst touring Teufelsberg, the abandoned US listening installation in Berlin. Pantha Du Prince Documentary from Rough Trade Records on Vimeo.